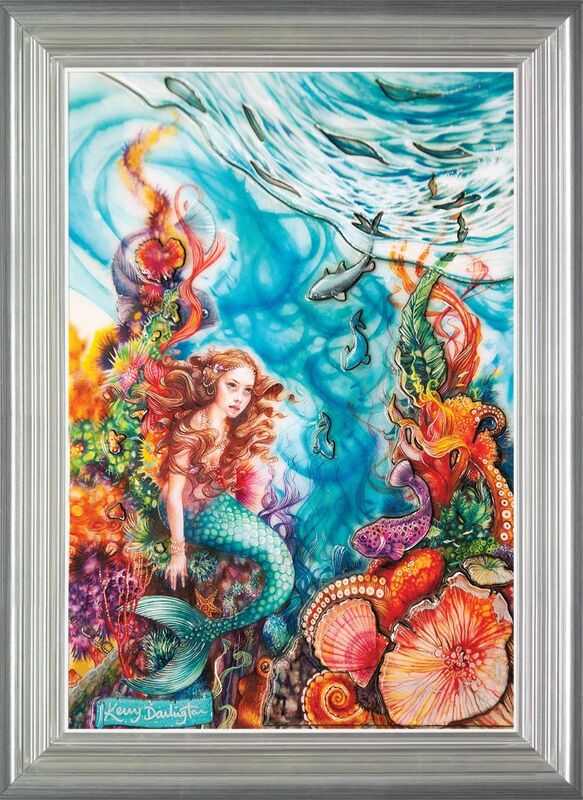 The Little Mermaid - framed by Kerry Darlington // £850.00. Good guess! No not the Disney film but Kerry Darlington's reinvention of the childhood classic fairytale by Hans Christian Andersen, that was its inspiration & predates it by some 152 years! A brilliant new underwater image by our favourite story book artist. Beneath the waves the 'Little Mermaid' sits on the coral, as her golden hair swishes in the water & she is joined by a plethora of underwater creatures and beings. Wonderfully hand embellished with coral, shells & exotic fish and on the surface, we see even more of them - some diving to be closer to be with the mermaid! Enjoy the big sways of blue that Kerry uses to paint the sea and changes of direction & light reflection, with much greater use of white denoting the surface. A fantastic new addition to the 'Unique Edition' range.